Cuts is the story of a young man named Albert Mason Prince and Albert has an obsession. He likes cutting people. It’s nice to have a hobby, but Albert’s hobby is not nice at all and, leaving a trail of dead bodies behind him, he is soon running from the police. Albert is not exactly a loveable character and he shows no remorse whatsoever for the terrible things that he does. He is quite the sociopath in fact and is hardly the hero of the story. He is, however, the main thread around which the rest of the story weaves. While Albert is busy shedding blood, causing mayhem and destroying lives, the other characters are all busy with their own lives and doing their own thing. The one thing that they all have in common though, is Albert and in one way or another all their paths are destined to cross. Janet Arthur is a young out of work teacher, who has just discovered that she is pregnant. Janet is happy to be carrying a new life inside her, but her partner Dave is outraged at the news. Of course, according to Dave, it is all Janet’s fault: she wasn’t careful enough and perhaps she even got pregnant on purpose to trap him. Either way he wants her to get rid of it. Dave is not a nice guy; he is a selfish man who walks under the towering shadow of his own ego and is used to getting his own way. On this occasion though, Janet says no way and, shocked by Dave’s behaviour, she leaves him and moves in with her friend Meg. Ian Collins is a school teacher and a good one too, but he is also a man with a secret. Ian writes mysteries under the name of Evan Chandler. He is as good a writer as he is a teacher and, unlike Dave, Ian is a thoroughly nice guy. Janet and Ian are just two of the characters in Cuts that the reader can get behind all the way, but some of the other characters, although nowhere near being in Albert’s league, are not so easy to like. Take Helen Bryant, for instance; she works at the same school as Ian, but her views on teaching are very different from Ian’s and she is perhaps a little too friendly with some of her pupils. Helen is not at all friendly towards her husband Lester though. She is a cold iceberg of a woman, even if she does hide that heart of ice underneath tight provocative clothing. It’s sad really because Lester, who works as a library secretary, is a pretty nice guy. Lester does form an unlikely bond, however, with one of Helen’s fellow teachers, an older woman named Emily Jean Bonner, who used to be an actress for a while when she was younger and now, totally disillusioned by teaching, feels that she has wasted her life. Emily is quite a sad character in many ways but she can also be extremely amusing and she takes an active roll in one or two of the book’s funnier scenes. All of these characters are interesting and never boring. Albert does not bore either. Slicing is more his thing and, when he eventually meets up with the nicer characters in the book, some of them don’t survive the encounter. I enjoyed reading Cuts. 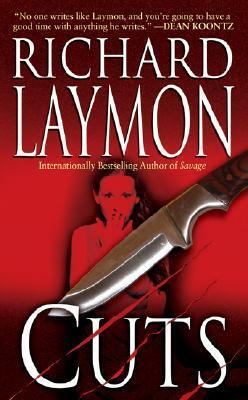 The book is a little graphic in places; the blood is red and sticky and very easy for the reader to picture in their minds, but if you have read Laymon before none of this will surprise you. Neither will it surprise you to discover that the book is well written and the characters believable. Cuts is around 300 pages long, it’s a great read, and if you are looking for a good horror novel where the horror is more bloody than spooky then this one really cuts the mustard.